The purpose of this corporation is educational: the organization has been formed and is maintained to research, document, preserve, and share the historic legacy of the town of Havilah, the FIRST county seat for Kern County, California (1866 – 1874). Included in this purpose is the objective of providing for the advancement of education about the history of Havilah and early Kern County people and places, to the local community at large, and to any and all visitors to our quiet little community. 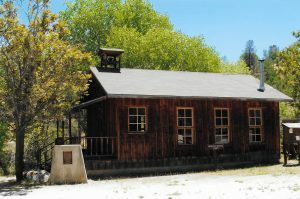 Colonel Thomas Baker was appointed as the committee chairman, and on April 2, 1866, Havilah was named the very first county seat for the newly-formed Kern County, California. Gold mining began to falter in the 1870’s, and many of the prospectors went to work for the owners of the larger mines in the area, or went down into the valleys where they went into farming, ranching, and/or agriculture. A vote was taken in 1873 to move the county seat to the now larger town of Bakersfield. The story goes that due to “some irregularities” in the voting, the ballots from three voting districts were toss out. Later, when ordered to be restored, some of those votes could not be located, and Bakersfield won by a margin of 22 votes. 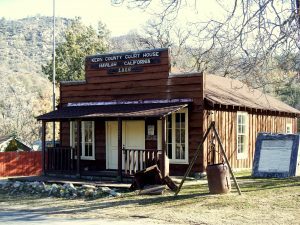 The county seat was transferred to Bakersfield officially in 1874. (Our good friend Chris Brewer, the Great-great grandson of Col. Thomas Baker, told us that Col. Baker had those ballots — and now he has them. Chris is going to locate them in his stacks and stacks of Baker memorabilia and will give us one to add to our museum. He has already donated several historical Havilah items, photos and handwritten documents.) THANK YOU CHRIS ! Through the efforts of these folks and many others in the surrounding communities, a replica of the 1866 Court House, and the Old Havilah School House were built upon land donated by Frank and Cleone Shaw. IT HAS BEEN SAID THAT ALTHOUGH MANY PEOPLE DIED IN HAVILAH DURING IT’S EARLY DAYS —– NOT MANY WERE SICK ! Take yourself back to the Gold Rush Days when it was mostly men that came to the goldfields, and they were from all over the world. You will notice, we said MOSTLY MEN, because the early emigrants included very few women. The society they left behind was not only very conservative, but restrictive. Most of these fellows left from rural, agricultural, and / or farming areas. In those communities you were forced to learn and use good manners, go to school, churches, and you had all kinds of friends and business associates. In other words, you had to act a certain way — you had to BEHAVE! On the other hand, here in early California, rules and especially any restrictions were scarce or non-existent. Wives, mothers, girlfriends, and children were hundreds if not thousands of miles away. Agencies we take for granted today, the Police Departments, Post Offices, Libraries, Banks, Roads, Schools, Churches, Courts, etc. were all back east or somewhere else, just not here. Like we said, all these were non-existent here in the 1840’s and the very early 1850’s when California was still under Mexican/Spanish Rule. To “keep the peace”, there were fewer than a couple hundred U.S. regular Army soldiers in all of California, and even then, they were separated into smaller units of say 20 to 30 men. Men came here with one common goal and that was to “get rich quick, then move on”. All you had to do was find that “pocket of nuggets” and you’d be set for life. No need for education, risky investments, working for someone else, or yielding to the whims of Mother Nature. This was the stage that was set here in the valleys. Gold was discovered near here at Hogeye Creek, shortly to be re-named as Keyesville for the mine discovered by Richard Keyes. Other mining towns were popping up in the Greenhorn Mountain areas, Quartzburg, Millville, Whiskey Flat (now called Kernville), and Isabella, (then known as Barton Junction, and now called Lake Isabella). The mining village of Clear Creek (yup, because it was established along a creek known as Clear Creek) was re-named Havilah —- “Land where there is Gold,” from the Bible —- by a former Kentuckian, Asbury Harpending. This was not only the time of the Gold Rush, but it was also during the great Civil War. Harpending was a southern-sympathizer and had just been released from jail in San Francisco after his failed plot to arm a ship in the San Francisco Bay and prevent any ships from leaving that were carrying goods to re-supply the Union soldiers. After his release he heard of many like-minded Southerners in the Whiskey Flat and Keyesville areas, and after arriving there and trying his hand at gold prospecting, he decided that it was too much work.So he decided to plot out a town and sell business and residential lots. With some of the money he made from the land sales, he bought up several mining claims. He was quite a businessman, and even though he was only here for around 18 months, he left in early 1866 with over $800,000, which in today’s money would be equal to a little over $11 million dollars. AND HE DIDN’T OWN THE LAND! In 1865 – 66 there were many successful mines and stamp mills operating in Havilah. Stage lines ran from Visalia, through Whiskey Flat (now Kernville), to Havilah, then on into Los Angeles. We had thirteen saloons, gambling and dance halls, four hotels, another thirteen mercantile shops, a couple of drugstores, three boot and shoe stores, two livery stables, two breweries, two billiard parlors (pool halls), four doctors and a small hospital, a jail, two barber shops, three fruit stores, two bath houses, one painting business, three blacksmith/wagon repair shops, and various other asundrey businesses — plus the usual “pleasure” establishments. See “In The Beginning …. ” (above) about us becoming the FIRST County Seat for the newly formed Kern County, CA 1866 – 1874. Due to several wildfires, the town having to be rebuilt, then the fact that mining was faltering and businesses were closing, never to re-open; the school and the Post Office both being permanently closed by 1920 —- our mile-long business area became a living ghost town. Thanks to the generosity of Frank and Cleone Shaw for the donation of the land, and the rebuilding of the 1866 Havilah Court House and Old School House museums, the Havilah Centennial Group, Inc. and a handful of local “do-gooders / unpaid volunteers”, we continue to preserve the rich / historic legacy of Havilah, and educate future visitors for years to come. All of this has been, and continues to be, accomplished by totally all volunteer work. No one gets paid for doing what we do, SO PLEASE HELP US TO KEEP OUR DOORS OPEN (and preferably, WITH THE LIGHT S ON!) All Donations Are Tax-Deductible as we are a 501 (C) (3) Non-Profit, Educational, Public Benefit Corporation.